People living in the United States have access to some of the best medical care in the world, from life-saving drugs to cutting-edge surgical techniques. But spiraling costs force many Americans to spend more on care and often receiving poor quality care for all the extra money spent. High prescription drug costs are at the core of the problems Americans face in the healthcare system. Insulin prices have nearly doubled. 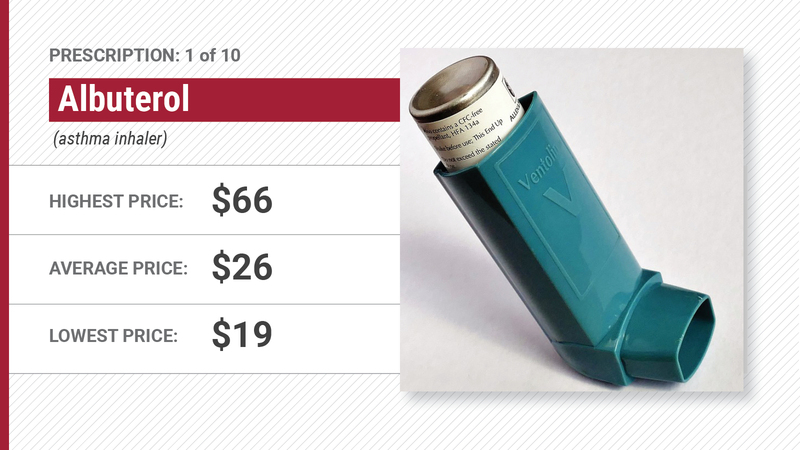 In January of 2019, the prices on more than 250 prescription drugs increased by 6%. These increases on top of prices already higher than many other countries have contributed to 1 in 4 Americans on medication struggling to afford their prescriptions. Many are then forced to make tough choices that undermines their health: splitting doses, failing to take their medication, or otherwise rationing care. Our research found that common life saving medication prices varied greatly, even within the same state or city, undermining quality of care. Most pharmacies offer a price 9x the cheapest available price for a medication nationally. You can save hundreds or even thousands of dollars a year for many medications by shopping around. [One or two sentences (25-50 words) of text: Explanation of the key finding. Geniet incia autatibus voluptate et repedita quam, core nost, ulpa nonem netur? Is doluptur at excerov idipsam, occab ium estrumenis volupta spitatur? Before they reach you, medication goes through a complicated maze of pharmaceutical companies, middle-men and businesses. And at each step, more cost is added to the cost of life-saving medication without returning higher quality care to patients. Prescription drug price transparency across the health care system as a foundation from which policy-makers can base further prescription price reforms and a way to help patients understand their costs. Enacting laws that require notification of drastic price increases, require justification for that increase, and empower the state and federal governments to reject indefensible increases. Spiraling costs force many Americans to spend more on care and often receiving poor quality care for all the extra money spent. Call on Congress to pass comprehensive prescription drug pricing transparency laws.